While I was down at Audi Wilsonville during my lunch break and while chatting with Scott Mitchell, a Sprint Blue B7 RS4 pulled in. 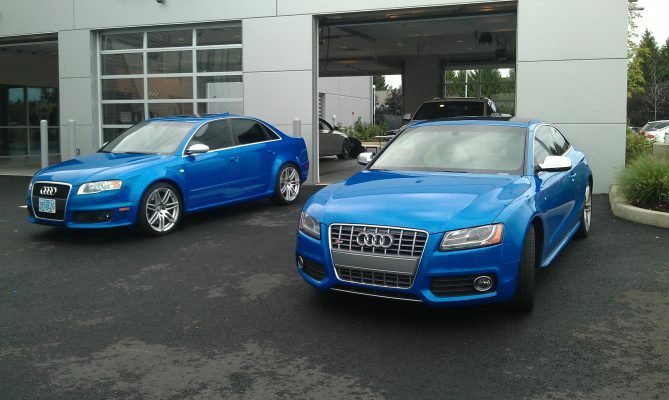 It’s pretty darn rare to see another Sprint Blue S5, much less seeing a Sprint Blue B7 RS4… but to have them parked next to each other? That’s ridiculously rare. What made my day even better was seeing two other B7 RS4 on the way back to work. The first one was dressed in Avus Silver turning on to SW 95th Ave in Wilsonville and the other one, Daytona Gray, was in front of me as I turned on to Hunziker Road in Tigard. Unfortunately, I didn’t get a chance to take a picture of either one; as, I believe using a phone to take a picture while driving goes against the Audi Safe Driver’s Pledge that I took (have you? ).